After the court ruling, attorney for the community, Gurdial Singh Nijar, speaks with the media. ELAW has worked for years with partners in Malaysia to protect the community of Bukit Koman from a polluting gold mining operation. Villagers conducted environmental surveys to identify contaminants. When Shirly Hue, Vice Chairperson of the Bukit Koman Anti Cyanide Committee, announced the survey results at a press conference, Raub Australian Gold Mining company sued for defamation. Last month, the defamation suit was thrown out. "Sherly Hue is one of the youths of this community who never gave up and continued to fight to the end, knowing well that if she lost, she would have had to pay hundreds of thousands in Malaysian Ringgit in damages and costs. But she had the support of the community all the way and the community shares her victory." "We must not lose sight of the fact that the existence of activist groups is very much part of today's society, so much so that it is undeniable that they have contributed much to the general well-being of the society at large... We now live in a much more liberal society where the concept of transparency and accountability are very much part and parcel of our lives. Hence the freedom of speech entrenched in our Constitution must be construed in that context." This victory has inspired ELAW partners around the world. "Congratulations for a wonderful victory," writes D. Nagasaila from Chennai, India. "Its a win, not just for the villagers, the activists and you all in Malaysia, but also a victory to celebrate for all activists around the world." ELAW Staff Scientist Dr. Mark Chernaik has worked since 2008 to help partners in Malaysia understand how the facility in Bukit Koman was impacting air quality. Mining expert and ELAW Director Glenn Miller traveled to Bukit Koman to tour the impacted area, meet with decision-makers, and talk about the risks the mining operation posed to the community. "We appreciate what each and every one in ELAW has done for all of us and the communities we work with," says Theiva. 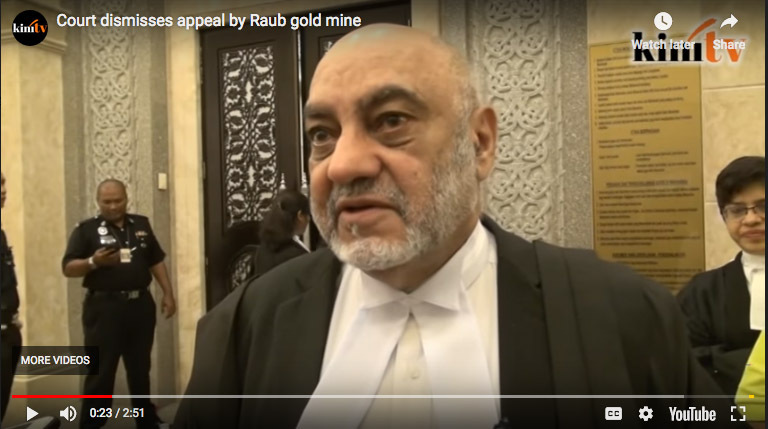 "The gold mining company is no longer in operation and is under liquidation, but we continue to fight because the mine needs to be closed and rehabilitated. The question remains as to who will pay for the rehabilitation cost. We have taken this issue up with the government and we are waiting to see what they intend to do. In the meanwhile, we will continue pursuing the closure and rehabilitation of the mine."